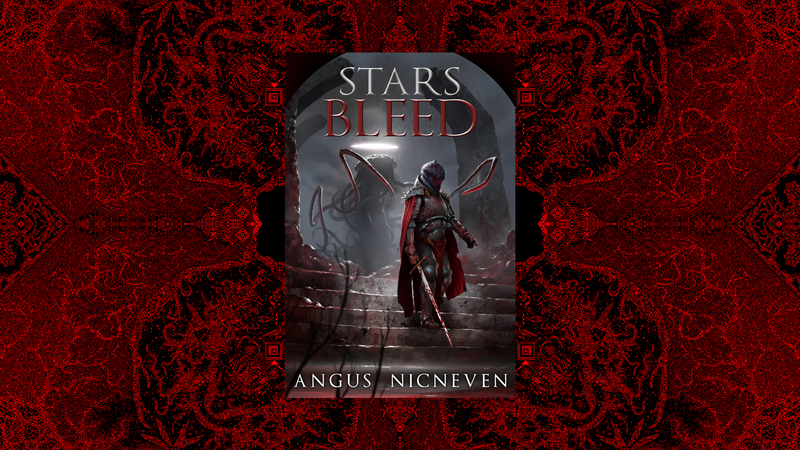 Mary got the opportunity to interview Angus Nicneven, author of dark fantasy novel Stars Bleed. Mary Ann Mahoney: Hi Angus! Thanks for speaking with me today! Tell our readers a little bit about yourself. AN: I’m a self-made weirdo, and I enjoy creating odd things in my spare time. Sometimes that odd thing happens to be a sprawling 8191 x 8191 pixel art image, or a whole book. Although, when I feel as though I’ve earned a rest, I enjoy playing some games and/or watching a good anime. Taking breaks is important, after all. MAM: Can you describe Stars Bleed for those who haven’t read it yet? AN: Stars Bleed is a book about the beginning of the end of a conflict which has spanned an unfathomable amount of time. It’s set right as the illusions come tumbling down, and the main character, Yukysh, tries to survive these events whilst figuring out where she fits in amongst it all. It’s a book that I wrote to communicate my deepest and most profound feelings about this universe and myself, and yet it’s only the first of many in the An Imperishable Phantasmagoria Cycle. MAM: Your protagonist’s gender is kept quite ambiguous at the beginning of the book. Is there a reason you choose to write Yukysh that way? AN: The book is set as a first person POV, and so it felt natural to not really include her gender, because when you’re climbing a mountain to either complete years of work, or to die a gruesome death, you don’t often worry about your gender. Additionally, there’s something else that readers are supposed to pick up throughout the book which reinforces Yukysh’s lack of attention on herself. And lastly, openings where characters are looking at themselves in the mirror solely for the sake of a writer who thinks that readers won’t be able to piece the story together are pathetic. I have a distaste for that sort of thing. MAM: What inspired the character ‘Shugokrur’? AN: Shugokrur’s design first came about as I was doodling a maid in my notebook instead of working on schoolwork. Behind the crudely drawn maid, floating there, was the first ever concept art of Shugokrur. With that little doodle in mind, I soon found that ghostly character a place within the first draft of my book when the main character required this cryptic, otherworldly companion. And the idea of this came from my research on love during this period of time. Mainly to do with thoughtforms and the concepts of tulpas. That was the start of Shugokrur, at least. With the passing of a few years and the analysis of what I had, vs what I wanted, I refined Shugokrur’s design and finally, myself, understood why Shugokrur was… Shugokrur. There’s more to be said in regards to all of the characters in general and how they relate to me and some of the concepts I’m trying to convey within the story, but that’s best left for a time when many more people have finished reading Stars Bleed. MAM: Although this book is written in English, there is also use of a fictional language too. How did you go about creating this language? AN: I didn’t set out to create it in any tangible way. That “language” is beyond our means. Think of it as the lyrics of our universe. The words of existence. A way to recall any point in time back to your current point. It’s a “language” that, even if we could use, wouldn’t be useful to us at all. At the very beginning I did consider actually creating that language and writing out an alphabet, but once I considered what it was I realized that if anyone could understand it or translate it perfectly into a form which we could understand, then it wouldn’t be what it’s supposed to be. MAM: Did you have to do any research when writing this book? AN: Nope. I just thought long and hard. Although there are many things that I already knew / were interested in that assisted my efforts in writing the book. The closest thing to research, though it’s hardly research at all, would be the fact that I bought a ps4 just for Bloodborne and played it a lot whilst reading H.P Lovecraft’s works. That really helped me on the Cosmic Horror side of things and made it much easier to convey my feelings. MAM: How long did it take you to write Stars Bleed? AN: I started writing the very first draft somewhere in 2013. I just kept perfecting my skills and bided my time until I could show off the book to the world, but it was a harrowing ordeal. Most of my editing and writing was finished by the start of 2017, but I experienced difficulties in getting it edited after that. MAM: Prior to publishing Stars Bleed, you created a pretty interesting website. Can you tell us more about it and where people can find it? AN: Ah, that… Well, I needed an author website, so I set out to create my own. I wanted it to be unique, since I think that cookie cutter sites with clear information, while to the point and useful for getting more sales, are boring. If my own site was so banal I would be disappointed in myself. So, I just started making things, and realized that I could link the book’s story to the story within the site’s own lore and strange pages, and I just went from there. Same as the book, I just got carried away whilst having fun, even if most of the fun is hard work and sacrificing time that I could have used to play video games and such. Yet it’s fun… somehow. MAM: What would you say was your biggest misconception about writing a book and getting published? AN: I thought I would have published it much sooner. I think that problem mainly stemmed from not knowing anyone at the time and having to search them out to get the ball rolling for everything else that must be finished once the final draft is laid out. MAM: What made you choose self-publishing as opposed to traditional publishing? MAM: Have you faced any struggles as a writer? AN: The first editor I worked with to edit my book strung me along for nearly a year whilst giving me a whole lot of excuses and no edits. Having to deal with that was stressful, and I had to pester that editor with emails just to get my money back, but at least it was the only big issue I’ve had as a writer. MAM: Do you have any writing rituals? AN: I’m always listening to music whilst writing. MAM: What’s your favourite book? AN: That’s a tough one… But since I can only choose one I’ll go with The Black Company by Glen Cook. MAM: What is the best piece of writing advice you’ve been given? MAM: What do you like to do besides writing? MAM: What’s next for you? AN: I’m going to start writing the next book after Stars Bleed, which is The World’s End. MAM: Is there anything you’d like to say to aspiring writers? AN: You should probably be writing. MAM: Where can people follow you on social media? AN: People can follow me on my Twitter, Facebook, YouTube, Twitch and send me emails! You can find my email info on this page of my website. MAM: Where can people buy your book? AN: Stars Bleed can be purchased on Amazon. Also, if anyone wants to read the first 3 chapters of the book to see if they’re interested, I have those uploaded here. Disclaimer: Mary Ann Mahoney worked as the editor of Stars Bleed for Split An Atom’s book proofreading and editing service.